Millions watching – SRH set a decent target - Bhuvneshwar Kumar bowled 10 consecutive dot balls bowled in the match ~ Watson was struggling to make runs and people started trolling ‘Watson quit Test cricket long back, why is he playing it here ?’ getting trolled is perhaps nothing new for CSK – they had been trolled as the "dad's army" after the auction, Chennai Super Kings managed to convert their perceived weakness into their biggest strength. Shane Watson, 36, was one of their many over-30s stars, and he came good when it mattered most, his unbeaten century delivering their third IPL crown. MS Dhoni, two months shy of 37, felt the key to their campaign lay in managing experienced players like Watson, even if it meant giving them slight leeway on the field. "I think we talk a lot about age, but what's important is the fitness aspect," he said. "[Ambati] Rayudu is 33, but he covers good ground. Even if he plays a few games where he's spent a lot of time on the field, he's not going to turn up and say 'I'm stiff'. So fitness matters more than age. What we have seen is that our fitness has improved. Most of the captains want players who move well on the field. "It doesn't matter who was born in which year, you have to be fit and agile. Yes, age is just a number." A team returning to centrestage, faced injury problems, could not play at their home – after their first match, when fringe groups challenged the conduct – and more - Super Kings won the final with ease helped by a century from the 36-year-old Shane Watson, who took 11 balls to get off the mark. But there is little to look at the scorecard that also contains the name of Faf, Raina and Rayudu. WAtto unbeaten 117 off 57 – 11 fours and 8 sixers !! - Bhuvneshwar Kumar and Rashid Khan, champion bowlers both, went for 17 and 24 in their allotment of four overs each, but that brought no panic to Super Kings' ranks. It was crucial that these two were not given a wicket; a maiden rather than a wicket. Ruthlessly, meanwhile, Watson targeted the young bowlers from Punjab, Siddarth Kaul and Sandeep Sharma, who went for 95 in their seven overs. If the chase was perfection, Super Kings were asked to dig into their defensive reserves when they bowled first. Sunrisers batted a little like Super Kings: take it slow at the start, keep wickets in hand, put pressure on the bowlers and go big at the death. Lungi Ngidi and Shardul Thakur, though, bowled well to restrict them to just 52 runs in the last five overs. It is the fourth time CSK had beaten Sunrisers in four meetings this season, an emphatic record against the team that had finished top of the league stage. Kane Williamson, the tournament's leading run-scorer, made 47 in Sunrisers' 178-6 in Mumbai. Victory gave Super Kings a record third IPL title. Chennai also won the competition in 2010 and 2011 and were runners-up in 2008, 2012, 2013 and 2015. IPL has changed the way of Cricket and cricketers. In addition to the financial benefits the IPL has brought Indian cricket, the league has had a huge positive effect on playing standards. Since the advent of the IPL, Indian national teams have been more confident and aggressive in their approach to the game, and nowhere does this better show up than in their fielding. The overseas influence on Indian cricket through the IPL has resulted in a more combative national team, confident in its ability to match it with any opposition. There's nothing like playing with and against international stars on a regular basis to help young players discover that despite their great skill, these lauded individuals are still vulnerable to a good delivery or capable of bowling the odd bad ball. Aside, Virat Kohli's much-anticipated county stint has been cancelled with a neck injury suffered during his penultimate IPL on May 17. The India captain will not be training for the next three weeks with a BCCI press release saying he will only resume on June 15 at the National Cricket Academy in Bangalore. He will then undergo a fitness test before he flies out for the tour of Ireland and England in late June. Sri Lanka batsman Dhananjaya de Silva has withdrawn from the tour of West Indies after his father was killed by an as-yet unidentified gunmen on Thursday night. Sri Lankan Police confirmed that Ranjan de Silva, Dhananjaya's father, was shot dead in Rathmalana - just south of Colombo - at around 8:30 pm. Ranjan was a councillor in the Dehiwala-Mt. Lavinia City Council, having been elected in February. Dhananjaya was due to depart to the West Indies on Friday, with the rest of the Sri Lanka squad. Many of his team-mates visited Kalubowila Hospital on Thursday night, where his father had been taken. For now, the team's departure has not been affected, though it is possible plans may change. Statistically, 7 Number of T20 tournaments have been won by MS Dhoni – most by any captain. His tally includes three IPL, Two CLT20, one World T20 and one Asia Cup T20 tournament. 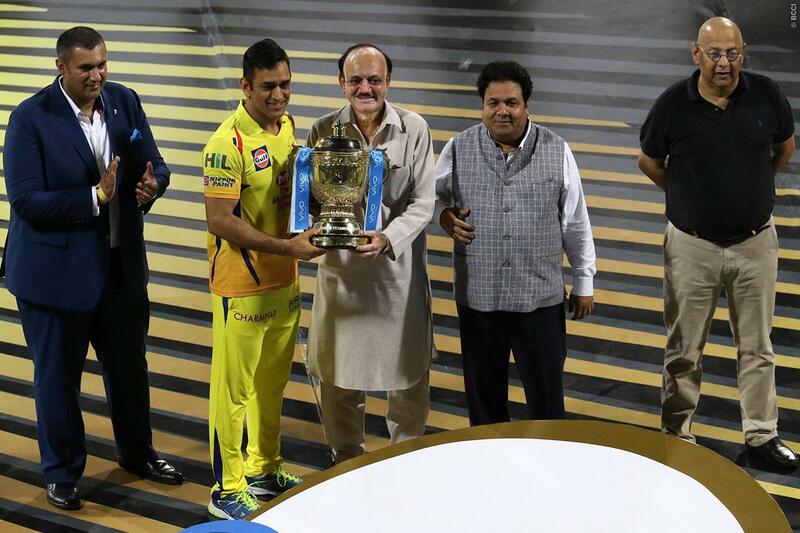 The man at the start handing over IPL cup is BCCI acting president CK Khanna. His wife, Shashi Khanna, will contest the Delhi and Districts Cricket Association (DDCA) elections slated on June 30. The veteran administrator’s wife has filed her nomination for the vice-president’s post. She will be fighting Rakesh Bansal, the younger brother of former DDCA president Sneh Bansal, who was stripped of all functioning powers following alleged financial irregularities to the tune of Rs 1.55 crore levelled by its executive committee.